alaTest ha raccolto ed analizzato 81 recensioni su Babyliss 7897U Super Bread. La media della valutazione per questo prodotto è 4.6/5, confrontata con la media della valutazione di 4.3/5 per altri prodotti. Abbiamo analizzato differenti valutazioni di esperti ed utenti, età del prodotto ed altri elementi. A confronto con altri prodotti, Babyliss 7897U Super Bread ha ottenuto un alaScore™ complessivo di 89/100 = qualità Molto buono. Easy to use, great features. Bought this for my husband and he absolutely loves it. Easy to hold and change the length settings and is great that you can lock the length settings. Once charged, lasts a long time and comes with a nice little stand to keep it in. Great all rounder. my husband loves this beard trimmer, his last one was fine but has worn out, he says this one is very easy to hold and won't alter the setting accidently. 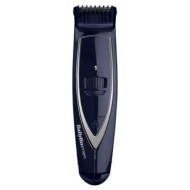 BaByliss 7897U 'Super Beard' Beard Trimmer. As the blades are straight it's not very comfortable .